We caught up with the hybrid DJ / performance trio Krewella while they were in New York this week for an exclusive interview. Indira Cesarine: I hear you have a new album coming out, and a lot of performances lined up – tell me everything! 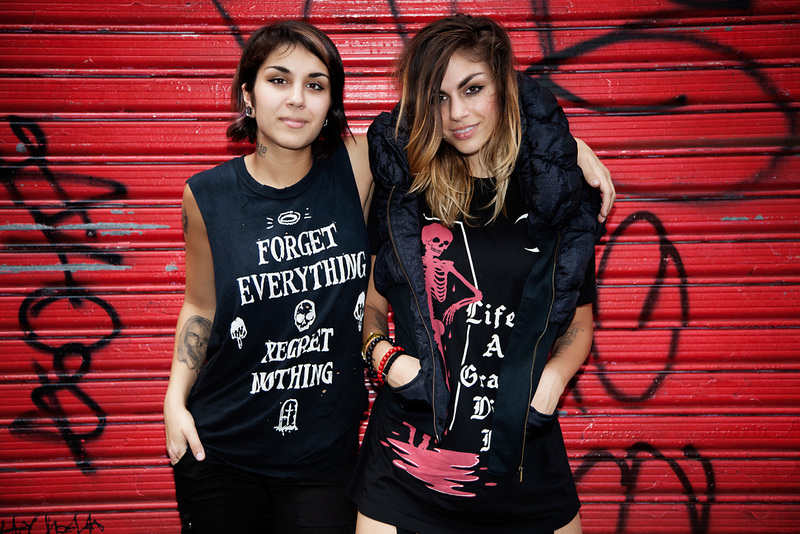 Krewella: I’m Yasmine and I’m Jahan we are two thirds of Krewella. We have a third member Chris aka Rain Man and he’s our producer. We are singers and song writers and we all DJ. You are from Chicago right? Yes, we are, it’s our city! How long have you been a trio? Almost seven years, since 2007, but we debuted only 3 years ago. It was July 2011 – so exactly 2 years, 2 months ago. We put out our first songs and it seems like so long ago. How did you come up with you stage name Krewella? This dates back to 2007. This was before Yasmine joined the group. We tried out a couple of other girls beforehand, when it was just Chris and I. The name popped in my head and I didn’t second-guess it. It was a very unique name as titles go, song titles, and artists names. I love names that are unforgettable, names that you can Google. The spelling is different to the Disney character, “Cruella”. 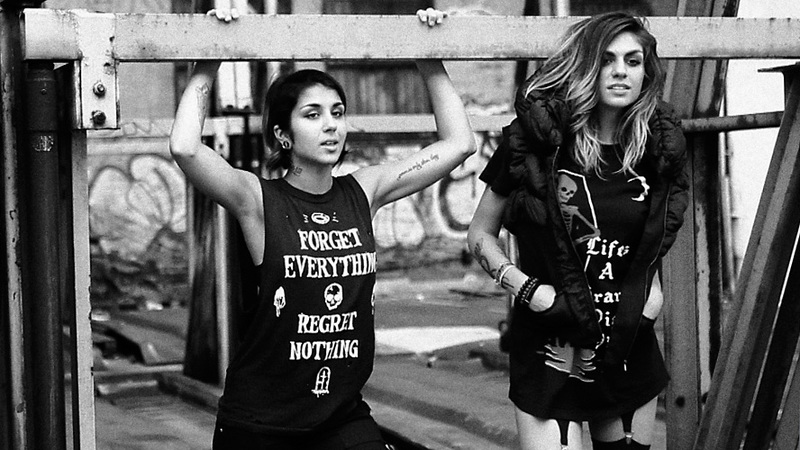 With Krewella I really feel like it’s something that people won’t forget. I love how it is feminine yet it feels dark and evil at the same time. It really represents our sound with Chris’ dark, metal inspired production along with our melodic vocals. That’s another thing that’s kind of fallen into place too, “Get Wet”. We naturally started calling our fans our “Krew”. Like K-R-E-W. We call them our Krew because we feel like they are our friends, our buddies, our team, and our family. They are not our little minions, they are our family and friends. That’s the point. 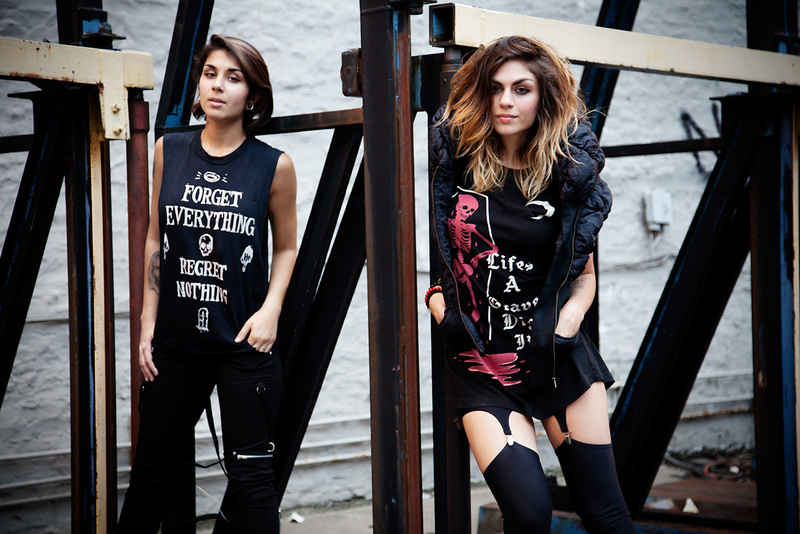 We are Krewella, they are our “Krew”. We all part of the same crew. You have a new album coming out called “Get Wet” can you tell me about it? It comes out September 24th. We have been working on this album for about 14 months now and it’s a combination of those past 14 months. There is everything on this album. We experimented a lot for this one. There is everything from drum and bass, carnival step, progressive house, electro house, and dub step. We tried to really open our minds to making music that did not stay in a box of a genre. We have a dope collaboration on this album with Patrick Stump and Travis Barker. That’s probably one of our favorite tracks on this album. That’s a good example of how we are trying to blend all of our influences. We grew up listening to pop, punk, metal, and rock. We are trying to bring that back into the music we are making now. It’s really exciting to have features like that in a song that we actually wrote with Patrick Stump and Travis. You came to New York for Electric Zoo, have you performed at the festival before? Last year was our first year – it was awesome. It was one of our first festivals ever. It was so much fun and great vibes. This is one of our favorite festivals in the states just because New York itself has so much culture and so many foreigners. It has more culture than other city and is full of color. It’s so diverse. I think the cool thing about Electric Zoo is that it brings in people from both coasts as well as people from all over the country. I think that’s what I love about it and it’s just amazing to see such a diverse crowd. I love the theme of if it too, Electric Zoo, the animal theme. It’s such a fun festival. It’s makes you feel like a kid. It’s one of our favorites. We were really looking forward to play because we played last year and had such a good experience. Yeah, we flew in yesterday. When we got to EZoo we found out that someone had passed and the festival was still going on. Everything was still running smoothly and so at that point I thought we would just keep going; it was kind of flying under the radar. I don’t think anyone wanted to blow it out of proportion yet because they didn’t know any causes. When they found out a second person died, I think it was just a big blow because that never happens at festivals. It’s pretty rare and it’s such a huge festival with lots of security. It’s really under wraps and everything is pretty taken care of at EZOO. They have tents with water that they are giving out. They look out for everyone. There are police everywhere and ambulances are there ready. It’s really hard to cope with something like that happening especially when you know these kids are either fans or fans’ friends and you know everyone is just having a great time. My first thought was I feel so sorry for these kids’ parents and their friends. They were just trying to go to the festival and have a good time. I realize that with drugs, when you throw them in the mix, there are going to be repercussions. They are just still two kids, I don’t care who it is, it’s still two kids that passed away, it’s just so sad. Yeah, it will probably move to a different location; it’s such an epic, amazing festival. It’s really not the festival’s issue. It just looks bad in the public eye and the mayor obviously has to take action. I really hope no one blames E Zoo or anyone that put on E Zoo. They worked so hard to put on an amazing festival for so many people. Each person individually needs to take on their own responsibility for themselves and things happen and it’s really sad. What other performances and events do you have lined up? We have our first headlined bus tour coming up. It starts next week. For the major festivals we will DJ and sing; on this bus tour it’s a hybrid live DJ performance. We have a custom stage production. We call the structure “The Volcano.” It’s a beautiful crystal structure that was produced by V Squared Labs. We have always wanted to work with them and we’ve finally got the budget to do that. Any sort of income we have coming in we’ve been reinvesting, putting every dollar back into the show for our fans. We are incredibly excited about that. We have opening DJ’s, Candyland and Seventh Lions who we love and are huge fans of them too. It’s cool that we all get to go on tour together. What is the overriding theme of your new album, “Get Wet”? We went into this album with a whole new perspective because we finally have fans. When we put out our last EP it was to a small group of people and we didn’t have a lot of people listening to us. Now when we went into making this album we have so many more ears listening to us. We really wanted to say something and we took a lot more care with the production and lyric writing. What is “Get Wet” all about? How does it feel to be a female musician and DJ in a very predominately male scene? We get asked that question a lot to be honest. We don’t feel any different, unique or special. We feel like one of the dudes. We’re tomboys ourselves. We like to rage and we like to get sweaty. Looking pretty and being clean is not a priority to our music. At the end of the day, it’s just making good music that’s the most important thing and being true successful artists. What other musicians are you inspired by? We grew up on everything from the ABBA’s Gold Greatest Hits CD to the Beatles, The Cure, Incubus, Fall Out Boy, Linkin Park, and System Of The Down. Then slowly moving onto more electronic like Justice and The Faint. We’ve listened to every genre and loved every genre. We are like open books when it comes to music, we just soak it all in. If you could be any other musician on the planet who would it be? System Of A Down and Serj Tankian, they are so badass. I want them to get back together. They fascinate me as performers. Serj Tankian is one of my favorite writers and as a solo artist too. He is absolutely amazing. If you’ve ever listened to his solo albums, everything from image to sound to performances is just amazing. Have you felt over like the last few years as you’ve been developing your sound and developing your fan base that there were any major obstacles that you have overcome? I think a lot of it was transitioning into the live element. We started off as DJs when we first released music. We didn’t even think about playing shows and all of a sudden buzz started to growing on the internet. We started getting show offers, like play this show for 100 dollars, play this show for 200 dollars, which divided by three, is nothing. We realized we have to find a way to perform our music and the people that were drawn to our music happened to be kids going to raves. We taught ourselves how to DJ because of that. We noticed that as we were releasing more songs that fans wanted more. They want more of you as an artist. They want you to perform live so no one has ever done this before. Very few artists do the DJ-live singing combination so we really had to. Yasmine and I had to reprogram ourselves and think no this is not karaoke. We’re not just singing over a track. When it ends we need to put in a new track. There are certain roles each one of us play, like an actual live band. One’s going to mix, one’s going to be mixing the next track. We perform our songs that are heavily produced with full vocals all over in the live element. That’s been a big challenge for us because we don’t really have someone to look up to whose done that. A lot of artists have a model that they follow but there is no model for the hybrid live DJ performance. We’ve basically done that and we’re really proud of it and were doing that on the fall tour. Do you perform on all the tracks or do you mix it up? We’ll mix it up. We will play remixes, for example – for tracks 130 Bpm progressive house, someone might make a really dope drum and bass remix of it and you can’t sing it. If its fast we will perform the original version mixed into a remix then in works just like the remix we are playing. So it’s really cool being DJ’s and singing because you have so much flexibility to morph for your songs. At festivals for examples like Electric Zoo would you also sing live? We were going to do live. What other festivals do you have coming up? Do you have anything exciting that we can look out for? It’s a big one in November! Festival season is over pretty much. It’s kind of sad. it’s mainly just our bus tour now. North America, we’re doing a little bit of Canada. We’re doing a lot along the coast. We’re not really hitting much of the Mid West unfortunately but hopefully on the next tour. How does it compare performing on tour versus when you’re performing at home in Chicago? I personally like performing in Chicago more because I love the energy. The kids in Chicago really understand and know the electronic scene. It’s been budding for the longest time there and they really like everything we throw down and that’s our home. There is a sense of loyalty too. We are very proud and we rep Chicago a lot and you can tell whenever we play in Chicago people can sense that pride that we have. It’s really fun playing in the Mid West and the smaller cities, like college towns because they don’t have many bigger artists coming through. For example LA, five nights out of the week you’ll have a huge section coming through and so many different clubs and venues. The Mid West doesn’t get that a lot but you can tell that they are eager and they are dying to use that pent up energy they have. They flock to it and they go crazy. They are just the craziest shows, the ones in the middle of nowhere; in farm towns. Is there anything you’d like to add, that you feel it would be good for your fans to hear about?